We are writing to you in your capacity as Chairman of the EPO Administrative Council. 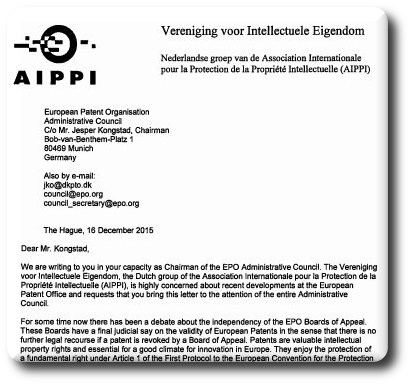 The Vereniging voor Intellectuele Eigendom, the Dutch group of the Association Internationale pour la Protection de la Propriété Intellectuelle (AIPPI), is highly concerned about recent developments at the European Patent Office and requests that you bring this letter to the attention of the entire Administrative Council. “Even patent judges from across Europe have expressed criticism in this regard.”For some time now there has been a debate about the independency of the EPO Boards of Appeal. These Boards have a final judicial say on the validity of European Patents in the sense that there is no further legal recourse if a patent is revoked by a Board of Appeal. Patents are valuable intellectual property rights and essential for a good climate for innovation in Europe. They enjoy the protection of a fundamental right under Article 1 of the First Protocol to the European Convention for the Protection of Human Rights and Fundamental Freedoms (European Convention on Human Rights). As such, applicants for patent protection and patent proprietors are entitled to an adjudication by an independent and impartial tribunal established by law under Article 6 of the European Convention on Human Rights. The independence and impartiality of the EPO Boards of Appeal from the EPO executive, including the President of the EPO, is therefore crucial and does not allow for any compromise. Currently there are insufficient guarantees for the independence, which may also cause concern with regard to the impartiality. This has already been found by the Enlarged Board of Appeal itself and there is consensus among the interested circles that this needs to be improved. Even patent judges from across Europe have expressed criticism in this regard. “Moreover, it seems that the President has misinformed the EPO Administrative Council on the involvement of the Boards of Appeal themselves in the development of this proposal.”It is very worrying that the process towards more independence seems to be dominated by the President of the EPO who does not appear to take into account input from for instance the Boards of Appeal themselves. On 4 December 2015 the President of the EPO presented an updated proposal for the reform of the Boards of Appeal to Board 28. This proposal does not contain sufficient guarantees for the independence and impartiality of the Boards of Appeal, since the EPO executive and the President still have a role of oversight and managerial control in the new setting. Any control of the executive over the judiciary could be considered a violation of Article 6 of the European Convention on Human Rights and the underlying principle of the separation of powers, and is therefore unacceptable because there should be no doubt at all that the EPO Boards of Appeal are independent and impartial. 1 December 2015. The fact alone that the Presidium felt it necessary to send such a letter is highly unusual and very alarming indeed. The ultimate consequence of these developments could be that national courts, and the future Unified Patent Court, do not consider themselves bound by decisions from the Boards of Appeal or even discard them as not constituting relevant case law. This would create a legal uncertainty which is highly undesirable. “The damage that has been done to the EPO and its reputation, and to the interests of the European industry, can unfortunately be seen as a result of the conduct of the President of the EPO…”Additionally, an immediate effect is that the reputation of the EPO as an organisation which safeguards the interests of patent applicants and proprietors and of their competitors is at risk. We have noticed an increasing flow of negative publicity on these issues in the media, including high quality newspapers. The damage that has been done to the EPO and its reputation, and to the interests of the European industry, can unfortunately be seen as a result of the conduct of the President of the EPO, who seems to be unable so far to approach the issue in a balanced way with proper respect for the separation of powers. Unfortunately, the public image that currently exists of the EPO is further damaged by another issue: the conflict on employment conditions, efficiency and “social democracy” at the EPO. We have no doubts that reforms are needed at the EPO. The Administrative Council has elected the President in full support of his roadmap and we do not question that roadmap as such. “In fact, it appears that the right of EPO employees to organize themselves in unions is not recognized. Instead, it seems that union officials are investigated and even interrogated by an investigation unit and then suspended. These suspensions are accompanied by cuts in their salaries.”However, in the execution of these reforms an increasing number of conflicts has arisen. As we understand from media coverage, but also from information obtained from persons who are directly involved, these conflicts are not handled in a way that enhances the probability of achieving workable results. Instead, the approach of the President towards these issues and conflicts tends to aggravate them without any necessity. The number and nature of the conflicts that we hear and read about appears to clearly exceed the limit of isolated incidents. As we understand, there is no normal dialogue with the workers unions. In fact, it appears that the right of EPO employees to organize themselves in unions is not recognized. Instead, it seems that union officials are investigated and even interrogated by an investigation unit and then suspended. These suspensions are accompanied by cuts in their salaries. In our view, it is impossible to achieve any result in this way. There are also reports of numerous conflicts with other members of staff. An increasing number of repressive rules and regulations appear to have been introduced which do not seem to fit in at all with a modem professional organisation. All of this has led to an increasing number of staff demonstrations. The way these issues are being handled by the President distracts the attention from the necessary reforms as such and instead leads all attention to the repressive approach chosen by the President. Again, this is leading to grave and maybe irreparable damage to the reputation of the EPO in Europe and abroad. “Again, this is leading to grave and maybe irreparable damage to the reputation of the EPO in Europe and abroad.”Because of these two issues, i) the endangering of the independence of the Boards of Appeal and ii) the way of handling of conflicts on employment conditions, which are both characterized by an intolerant approach by the President of the EPO so far, at least in the eye of the majority of the media, the position of the EPO itself has come at risk. Regardless of which solutions should be adopted to guarantee the independent position of the Boards of Appeal and to resolve the social unrest at the EPO, it is imperative that the Administrative Council takes immediate action to terminate the destructive approach chosen by the President of the EPO. We therefore urge and beg the Administrative Council to take control of the situation and prevent that further damage is done to the EPO.